Ce document au format PDF 1.4 a été généré par PDFCreator Version 1.3.0 / GPL Ghostscript 9.05, et a été envoyé sur fichier-pdf.fr le 28/11/2015 à 08:48, depuis l'adresse IP 109.22.x.x. 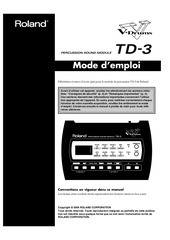 La présente page de téléchargement du fichier a été vue 386 fois. Taille du document: 101 Ko (5 pages). terms concerning variations of shades are given; these can be chosen freely. - phaeomelanin or pale pigment, fawn. When there is no pigment, white is obtained. Coats are classified as solid, mixed and modified. three types : dark, pale or white coats. diluted, blue or beige if it is diluted. The black coat presents no problem. less dark. The nose leather is always brown. The iris tends to be paler. 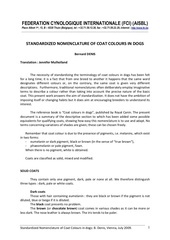 Standardized Nomenclature of Coat Colours in dogs: B. Denis, Vienna, July 2009.
is blue. Animals are blue at birth. Variations of shades are possible. sand if it is diluted. There is an enormous variety of shades in fawn and sand coats. fawn mantle” (cf Akita Inu), there is the possibility of precising “fawn, very pale distally”. are important variations of shades to the point of being almost white on the palest subjects. 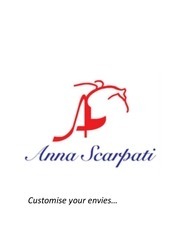 The nose leather is always pigmented and can be of various colours, normal or diluted. partial (“butterfly”) or total depigmentation (flesh colour). fawn markings, fawn with mantle. mask”, “blue mask”….. The nose leather is the same colour as the mask. on any of the following four coats. synonym for “moderate overlay”. If each hair has overlay, see further down. “brown”…. For example: coat “fawn with slight brown overlay”. This coat is frequently masked: “fawn with overlay, masked”. agouti” or “brown fawn agouti”. referred to as “blackish”, “bluish”, “brownish”….. These coats are often masked. We therefore state: “Fawn brindle, with mask”. For example: coat “sand with heavy blue brindling, with mask”. 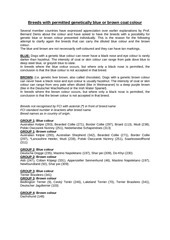 extremities.The variations are first caused by black being replaced by blue, brown or beige. saddle.The variations are first due to black being replaced by blue, brown or beige. changed the aspect. Three procedures have been retained: greying, mottling, spotting. white) and red-roan (mix of fawn and white) can also be included. Only the dark pigment (eumelanin) is concerned. (logically: “mottled beige with fawn markings” is sufficient), “white with black mottling” etc. “sand with overlay, masked, with moderate spotting”, “fawn brindle, with invasive spotting”. 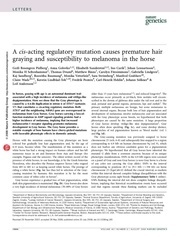 coloured hairs), or blotched (small patches of colour on the skin; the hair remains white). the modification should always be placed after a comma: “base coat, modification”. clumsy but beauty is not always compatible with precision and universality. Ce fichier a été mis en ligne par un utilisateur du site. Identifiant unique du document: 00382153.